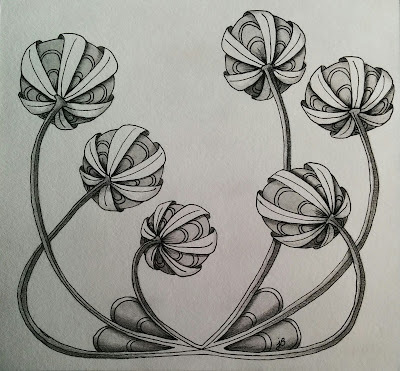 PurposeWorks Studio: The Diva's Weekly Challenge #276: "DuoTangle - Poke Root vs. Drupe"
The Diva's Weekly Challenge #276: "DuoTangle - Poke Root vs. Drupe"
In my last post I talked about gaining creative confidence through the versatile and accessible artform of Zentangle®. Though this is not the only form of art I'm actively producing, I'll probably post a lot about this topic simply because it was so instrumental in getting me back into making art after so long away. 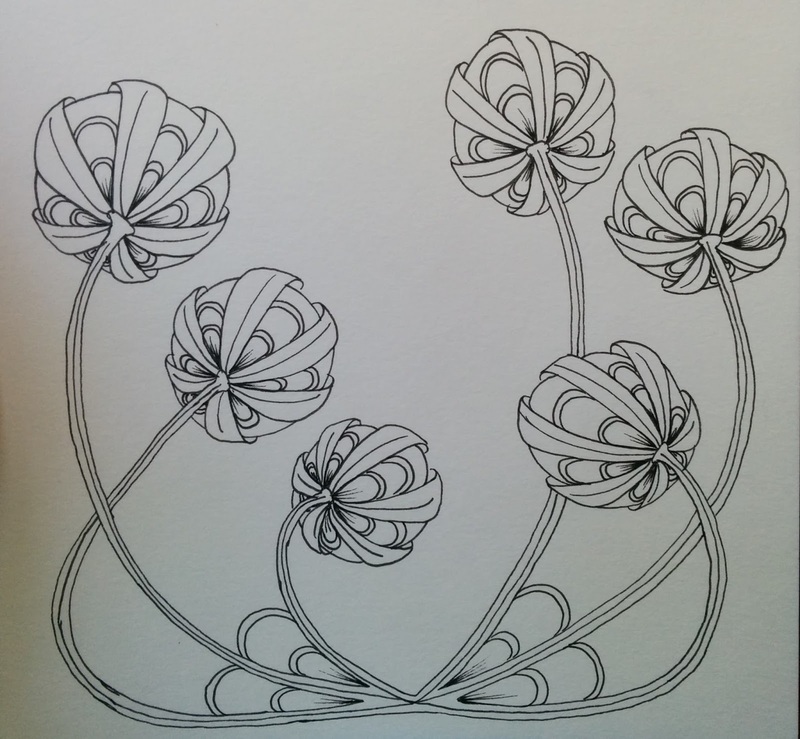 There is a large online community around Zentangle and Zentangle Inspired Art (ZIA), with blogs and challenges and even Facebook groups dedicated to the practice. One blog that's been around for several years is I am the diva which is run by a Certified Zentangle Teacher (CZT®) and home of the ORIGINAL Zentangle Weekly Challenge. The weekly challenges provide some inspiration and direction while also offering a way to connect with others and share your creations. This week I am the Diva posted Weekly Challenge #276: "DuoTangle - Poke Root vs. Drupe". The Diva coined the term DuoTangle and in this week's post she explains that by placing the constraint of using only two tangles, it's an opportunity to discover how the two patterns relate to each other or even merge together to create something new. I'd been exposed to this idea before, but this time I was really ready to receive it. Learning is like that. You can revisit a topic many times throughout your life and learn something new every time. 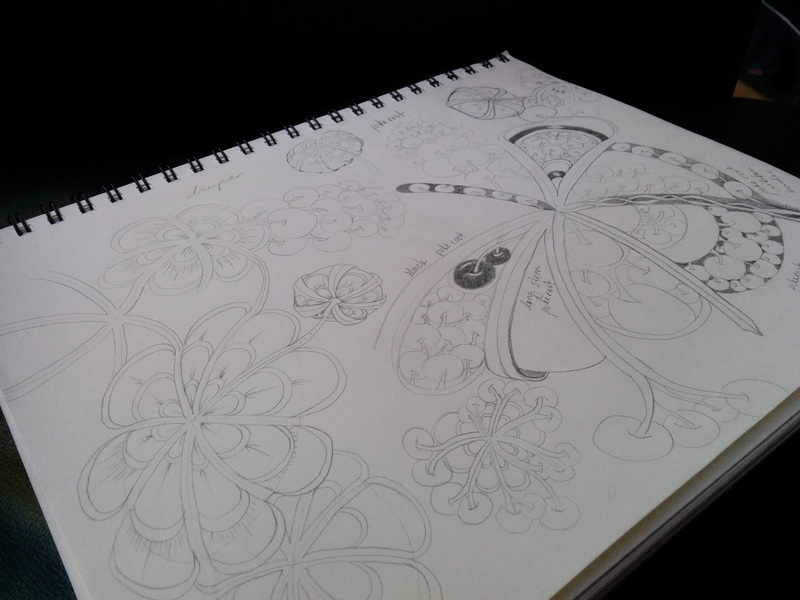 First I practiced the two tangles individually and experimented with creating variety of ways of drawing each pattern. I used a pencil because the smooth, almost effortless glide across the page frees my mind up to focus on shape, line, repetition, and variation. As I experimented, I began to see ways to integrate the two tangles and played with those ideas until I found something I really liked. 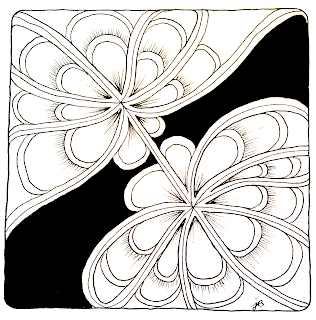 I repeated this new interaction until I could draw it smoothly and comfortably, remembering to keep the zen in Zentangle! Next it was time to ink the tile. I'm using a 6" x 6" sketchbook with paper that has a good thickness and tooth to it. This photo shows the line art before shading. Next comes the shading. I used three different graphite pencils (2H, HB, and 4B) a white vinyl eraser, and a blending stump to get all the nuances of the shading and shadows. 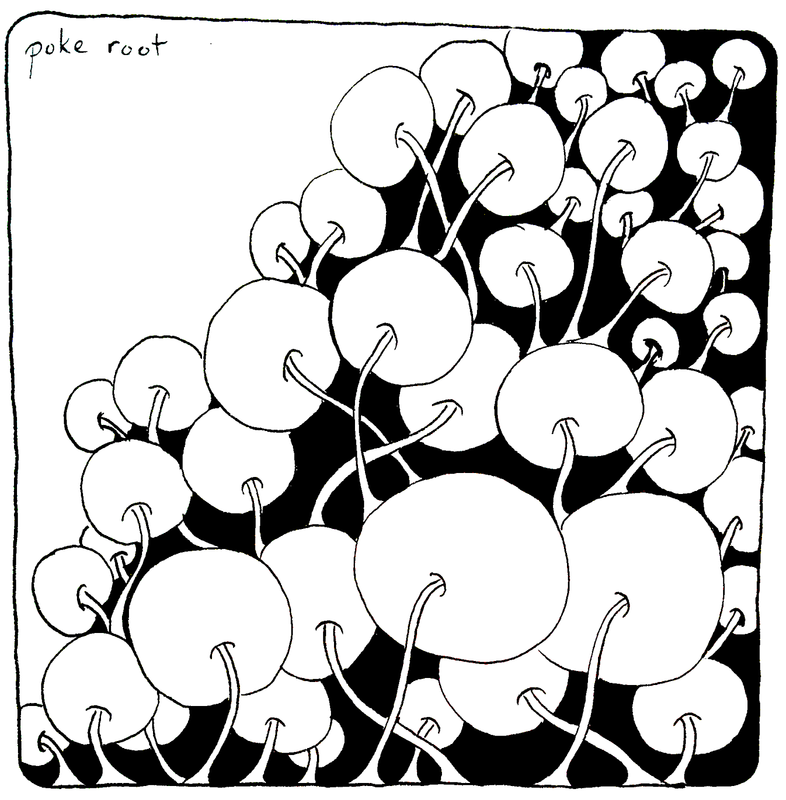 You can see the way I wrapped the drupe tangle around the roundness of the poke root, elongated stems, and added more drupe at the base. In the end this DuoTangle reminds me of a clover plant in bloom, so I have named it Cloverly. Here is the finished piece after the all final touches have been added! This is a very nice and original endresult, you have made from this challenge! Thank you for the kind words, Ria! And thank you for being the very first person to comment on my brand new blog. Happy weekend! I absolutely love your Cloverly!!! That is what practice and playing with a tangle will do for you. 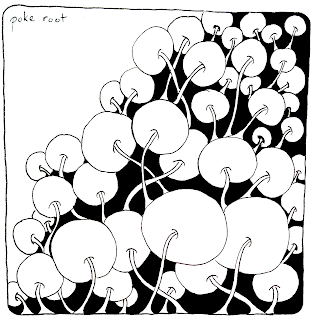 I tried something similar but didn't realize I should have the drupe radiate from the bottom of the pokeroot. Yes, absolutely, when I gave myself permission to just play and explore, it really clicked! Thanks for your sweet comment, Michele. Really wonderful work, and thank you for the process as well! Wow, what a beautiful result!!!! Welcome in this community! Thank you so much, Anne. I very much appreciate the welcome! Wow! Your work is so beautiful! Happy Sunday! Thank you, Betsy! I feel the exact same way about other people's art all the time, and yet, I can also see how much my own art has grown with practice over time. That's kind of what this blog will be about. You can do it too, I know it! Thank you so much! I like yours as well! If Escher made the Truffala trees... they would look like this I think. Lovely and amazing!